We were talking on the phone tonight, as is usual for us. The conversations help me to feel not quite so alone. He tells me what he has seen that I find interesting – mostly critter stories. Suddenly he began saying ‘what? What did you say? Where are you? The phone sounds hollow. Have you got it on speaker?’. I laughed out loud. Who ever heard of a speaker phone as a cell phone? I was still laughing as I explained to him that if I had a speaker phone thingey, he was going to have to school me. Again. I tend to forget things quickly and often. I wandered into the living room, listening to him struggling to hear me. I found it rather amusing. The difficulty is usually the other way around. I was doing the usual thing, holding the phone to my ear. I asked him to wait a minute, laying the phone down for a second – and I stopped right there! It was easy to see what the difficulty had been. I was holding the phone upside down! I didn’t find it nearly as funny as he seemed to find it. I think he is still laughing. No wonder. I will try to check that little detail next time we speak. sigh. Dag nab it! 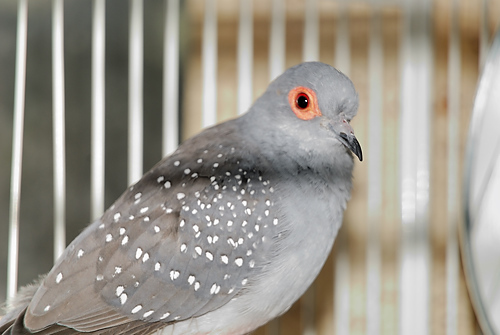 This morning, our little Diamond Back Dove (named Truly in honour of her lovely song) slipped away in my hands. I don’t know what happened to cause illness – she seemed to have a little trouble flying up to her perches yesterday. She wasn’t singing. This morning she waited til I went over to say hello and goodbye to her. Our male Ring Neck Dove, Lovey, is constantly looking into the cage. I suppose I had better remove her from her cage so Lovey will be more composed. They talked often. Looking out on a froggy snowy morning. I had better check to see how the highways are through the mountains. Haven’t heard from Fuji yet. I am sure he is fine, but when I want comfort, he is the love I reach for. How fortunate am I to have a love like that? I miss him. Today is work. I have better get moving here. Even my coffee tastes a little flat. Nothing wrong with the coffee. It is me and my taste buds that are a little off. Haven’t found a positive word to say. I will return when I have something else to contribute to the day or days. Can never tell. Travel the Rainbow Bridge, little bird. You will be flying free. Be happy. Mammograms have changed since my last one. I must say I like the new ones a lot better. There is a neat trailer travelling the back roads of Alberta giving the life saving tests – a lot less pain, a lot less squishing. Yay! So that is done, results at 7. Actually, 14 days through my dr. No problem. I am sure that won’t be my difficulty this year. Picked up my cat cage at the vet’s today. Everyone greeted me with smiles and the good news that Sunny Boi has settled into his new home very well. He is very affectionate, as I mentioned, and he is making friends left and right. That makes me happy because it sounds as though he is happy. He is addicted to being petted and kind voices, so all should be well. They commented on how LONG he has become since they saw him six months ago. He was a tiny feline and now is the same length as Ewok. Speaking of Ewok, her back is healing well. I am a little undecided as to when the meds should stop. Maybe I will call tomorrow to ask some advice. I am tired so have totally forgotten why I started this blog. There is a topic hovering just out of mental reach so will close with a good night blessing to all and will write again soon. Just finished going over my pics with the Fuji. He is actually teaching me how to capture what I see! It has taken years but I believe I will improve until I am finished on this earth. I truly have the bug – the desire to capture everything I experience for future reflection. How great is that? I ask myself that question as I cruise the back roads, watching for possible shots as I try to steer ON the road and not in the ditches, attractive though they might be. I like the search, the way my breath catches when I spot a possible capture. It catches even more if I get stopped in time to take the picture. I sure do like the search. Tonight I interacted with two does, in canola fields about 15 miles from each other. I found out that I am glued to wildlife subjects no matter what else is going on. I found out that I am totally unaware of objects crossing my subject, like wires, car mirrors and such like. As I perused one set of one doe during editing, I saw the background for the first time. Too bad I hadn’t noticed it originally – I could have done something with those shapes. I drive too fast when I am on the hunt, and pass things I wanted to work with – about three miles back. It is too much trouble to find a place to turn around, drive back, find another place to turn around only to discover that the fading light has disappeared and, with it, the shot I wanted. Time waster. So I refuse to turn around but it hurts, dang it, it hurts to have missed what I saw the first time in the original light. sigh. Did I mention I love the hunt? I love that I can hold a subject with my voice, soothing it into stillness until I capture the sweet face, the wonderful eyes that show the soul of the creature. It is like a magnificent dance; how close can I get to capture the best of the scene I love or the lovely critter who trembles with curiosity without damaging the rhythm or losing the shot entirely? I constantly remind myself ‘breath in, hold it, take the shot’. I made up the procedure myself, and it may not be correct. It is an experiment to see if I can control my shaking camera while I remain intently focused on my stance and ability, such as it is. This is the most fun I can remember having in a very long time. I am very happy to be learning now and not when all pictures were shot on film. Seriously. So the lovely deer and the red sun as it set are gone now. Darkness has fallen and peace reigns in this house. Fuji is home, LD is down in his office with him (she doesn’t leave his side when he is home) and I have managed to chase the cats off the back of my chair. Hair tends to stick to a person when it is hot. Should cool down now, though. It’s all good. Great sigh of contentment. There is a music festival in town all weekend – the temperatures seem destined to allow me out to investigate some of my faves. There is some Blues this year!! Or is that, there ARE some Blues this year? Whichever way that goes, it is going to be a good time. There may be some rain. I have umbrellas. Also it will be interesting to see how I do with people in the lens, don’t you think? Just coming out of a rough patch. I mixed up my meds and then worked out in the hot sun – the results go on for a while. I am missing my neighbour Ede who is in hospital for hip surgery. All the best to her – can’t wait to chat with her over coffee. I love her lots and lots. Wish I could tell her so. I am in my office with my little dog asleep at my feet. Cats are cat-napping. We have a large harmless spider in the garage – I am not nearly so eager to go visit the birds and cat there as I have been in the past. The web is head high, and I really work at remembering where it is. I have no desire to walk into the web – spider on my head? No way! I think this is one of our lovely large Wolf Spiders – they have a picture on the abdomen but don’t do harm. Except to flies. That is one of my favorite things about them. Wherever they are, flies are not! My Fuji will be home tonight, and that makes this a day of anticipation and small successes. Our temp today is nearing 25 so far, but there is a lovely breeze which makes the house cool, cool, How comfortable it is! I am going out in the sunshine for a few minutes with the LD (Little Dog) and then I PROMISE I am going to do the dishes. Really! !